Stopping power, quality, fit and warranty are all very important things to consider when choosing the correct Brake Rotors for your vehicle. Because we specialize in brake products and machine all performance rotors in our US facility, we are able to offer the best warranty and variety to fit your driving needs. Click on the comparison chart button below to help you choose the correct rotors for your vehicle. 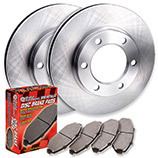 This kit was designed with the perfect combination of brake rotor and brake pad for dramatically improving stopping power over the factory braking system. Each brake rotor consists of curved slots machined off the edge of the rotor to improve braking performance. Each curved slot also removes water, dust and debris while cooling the temperature of the pad surface. All Cross-Drilled holes are chamfered and perfectly sized to give the maximum ventilation without structurally weakening the brake rotors. We selected premium semi metallic brake pads because of there high heat and friction level. The cross drilled and slotted brake rotors included in the kit are sold in pairs. The rotors come zinc coated in either black or silver to help prevent rusting and give you a performance race look. We include a free lifetime warranty against defects in materials and workmanship. As of March 2015, we now include a lifetime warranty against warping and cracking. The Brake Performance Dimpled and Slotted Brake Kit is engineered to give incredible stopping power over factory rotors while reducing heat, noise, pad fade and brake dust. All slots on our rotors are curved and strategically machined off the edge of the rotor to dramatically improve braking performance up to 30% over factory stock brake rotors. Each dimpled-drilled hole is perfectly sized to dissipate heat without sacrificing rotor strength. The premium semi metallic brake Pads will give you a higher heat and friction level with the lowest dust possible. The Dimpled drilled and slotted brake rotors included in the kit are sold in pairs. The rotors come zinc coated in either black or silver to help prevent rusting and give you a performance race look. We include free the best warranty anywhere, lifetime against warping, cracking, and any defects in materials and workmanship. 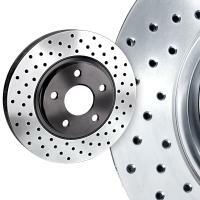 Slotted brake rotors have always been a great alternative for improving braking without the drilled holes. Brake Performance created this kit to give improved stopping power over factory rotors while reducing heat, noise, pad fade and brake dust. 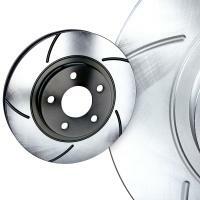 Each brake rotor consists of curved slots machined off the edge of the rotor to improve braking performance. Slotted rotors are manufactured from premium quality cast iron that meets or exceeds ISO and QS specifications. Premium semi metallic brake pads were selected for this kit because they have the highest temperature fade resistance and friction level of any brake pads we sell. 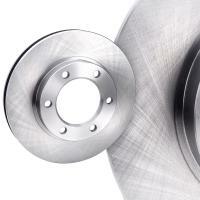 Cross drilled brake rotors are used on many performance and European vehicles. This kit was created to give improved stopping power over factory rotors while reducing heat with the use of drilled holes. 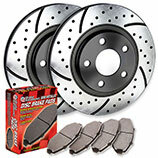 Each kit consists of premium cross drilled brake rotors and premium semi metallic brake pads to give the perfect balance of braking performance. The cross drilled brake rotors are manufactured from premium quality cast iron and the holes are chamfered to eliminate cracking. Premium semi metallic brake pads were selected because they have the highest temperature fade resistance and friction level of any brake pads we sell. 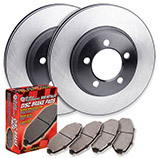 Brake Performance premium brake rotor kit combines premium semi metallic brake pads with our premium replacement brake rotors to provide reliable stopping power at a great value. Premium semi metallic brake pads are manufactured with extraordinary wear and high temperature fade resistance to give you improved braking in all driving conditions. Premium brake rotors include a very special black electro statically applied rust preventative coating on all the non friction surfaces. Manufactured from premium quality cast iron and guaranteed to fit original equipment manufacturer specs without modification. Our standard replacement brake kit is a perfect solution when replacing your worn out brake rotors and pads. We combine our premium semi metallic brake pads which are designed to give you extraordinary wear and high temperature fade resistance. Standard replacement brake discs are manufactured from premium quality cast iron that meets or exceeds ISO and QS specifications. Guaranteed to fit your vehicle's original dimensions without modification. Customers are always pleased with the improved braking and money savings over factory rotors and brake pads. These beautifully machined cross drilled and slotted brake rotors include the same slotted design as the premium dimpled drilled and slotted brake rotors giving you incredible stopping power while keeping the dust away from your wheels. The cross drilled holes are chamfered to eliminate cracking and move air from the disc surface while reducing surface temperature eliminating hot spots and warping. Cross drilled brake discs are machined balanced, surface ground finish double disk smooth and guaranteed to fit original equipment manufacturer specs without any brake modification. The cross drilled and slotted brake rotors are sold in pairs and come zinc coated in either black or silver to help prevent rusting and give you a performance race look. We include free a lifetime warranty against defects in materials and workmanship. As of March 2015, we now include a lifetime warranty against warping and cracking. 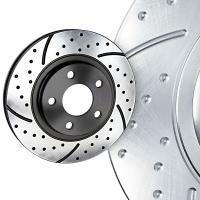 The advantage of the premium dimpled drilled and slotted brake rotors is the superior braking power you will experience over your stock brake system. Partially drilled dimpled holes dissipate heat without penetrating the brake pad surface and sacrificing brake disc strength. Our fully extended curved scraper slots not only give you unbelievable stopping power but they also throw the dust away from your wheels keeping them cleaner. The brake rotor or disc is machined balanced and guaranteed to fit original equipment manufacturer specs without any brake modification. 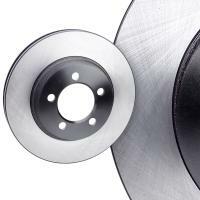 All performance brake rotors are sold in pairs and come Zinc coated in either Black or Silver to help prevent rusting. We include free the best warranty anywhere, lifetime against warping, cracking, and any defects in materials and workmanship. 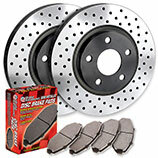 We also recommend premium semi metallic brake pads with every set of premium dimpled drilled and slotted brake rotors for ultimate in braking power. Our slotted brake rotors are machined with fully extended curved slots that increase stopping power and channels water from the brake pad surface to give you better braking in all weather conditions. The slot design on the brake disc gives you precision braking with the added benefit of displacing the dust away from your wheels and brake pad surface giving your vehicle up to 14' of shorter stopping distance. The brake rotor or disc is guaranteed to fit original equipment manufacturer specs without modification and are machined balanced with a double disk smooth surface ground finish to reduce noise. 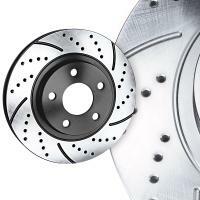 All performance brake rotors are sold in pairs and come zinc coated in either black or silver to help prevent rusting. We include free a lifetime warranty against defects in materials and workmanship and a two-year warranty against warping and cracking. Because we machine our own brake rotors in house, we provide cross drilled brake rotors for the customer who desires better cooling without the use of slots. Cross drilled holes move air from the surface while reducing surface temperature eliminating hot spots and warping. We go to the extra expense of chamfering the holes on our brake disc to eliminate stress cracks and extend the life of the brake rotor. These rotors are guaranteed to fit original equipment manufacturer specs without modification and are machined balanced with a double disk smooth surface ground finish to reduce noise. The cross drilled brake rotors are sold in pairs and come zinc coated in either black or silver to help prevent rusting and give you a performance race look. We include free a lifetime warranty against defects in materials and workmanship and a two-year warranty against warping and cracking. This premium brake rotor includes a very special black electro statically applied rust preventative coating on all the non friction surfaces to withstand 400 hours of salt water exposure. These brake rotors are machined mill balanced to a tolerance of less than 2oz per inch. This machining process reduces feedback associated with rotor vibration and provides a smooth confident application of braking force. All premium brake rotors are x-ray inspected and machined with a double disk ground taper free smooth finish providing quieter and smoother stops. Double disc grinding leaves a non directional finish for more effective brake pad to brake rotor break in extending the life of the brake pads. Manufactured from premium quality cast iron and guaranteed to fit original equipment manufacturer specs without modification. Premium brake rotors include a lifetime warranty against defects in materials and workmanship and a 1-year against warping and cracking. 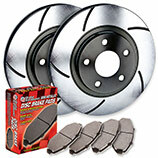 We carry a large inventory of new replacement brake rotors to accommodate most year, make, and model vehicles. These original equipment plain replacement brake disc meet or exceed federal safety standards and are manufactured from premium quality cast iron. They are x-ray inspected and balanced providing guaranteed vibration free performance. Our standard brake rotors are guaranteed to fit original equipment manufacturer specs without modification and come with a double disc smooth surface ground finish to reduce brake noise. The standard brake rotors come with a lifetime warranty against defects in materials and workmanship and a 1-year against warping and cracking.